In the Lleida Region in Catalonia, which is in the northern part of Spain, accomodations and other services are certified motorcycle accomodations. The Tourist Board took a good an important decision to certify the hotels - and the unique project is called "Moturisme Ara Lleida"
The project "Moturism Ara Lleida" consist in the creation and promotion of a seal for tourist quality specialized in motorcycle tourists, which is being implemented in accommodation and other services such as restaurants, museums, motorcycle dealers, motorcycle circuits, etc ... With other words - all you need as a motorcycle rider to have a great holiday and to enjoy the Lleida area on your motorcycle. This fantastic and unique concept has the aim to show Lleida province as a territory made for motorcyclists. And they have proven this to be right. The Regional Tourist Board of the province Lleida is the one who have created the new "Moturisme Certification". They invited all the Hotels, campings and rural houses about a course that was going to take place to get this new certification.The certification is made on each hotel in details as to ensure all requirements are fulfilled, and only hereafter the hotel will get its certificate. "Moturisme Hotel Certification" does not exist in any other place in Europe, just in Lleida province in Catalonia, Spain. And for this bikers this means there are approx 40 different types of accommodation, all located in a large area were they have a lot of bike tours to ride. 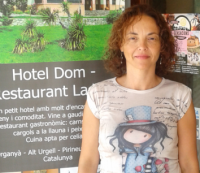 "I am the owner of the Hotel Dom, located in Organyà (Lleida Pirynees) and I decided to join this program. First, because I already have a lot of bikers guest and also because I am always happy to learn, improve and get more people to discover our region. While I was doing the certification course, Gonçal (Certification project manager) introduced us to Tourstart." "Once I registered on Tourstart my first thought was to collaborating with Tourstart, in order to let all Tourstart members know about my and the other hotels having the new certification "moturisme". Also I thought about offering a special discount for Tourstart members, so it will be possible to plan the entire motorcycle holiday and sleep in different hotels with a discount and a very specific service and facilities for bikers. I decided to contact the rest of the hotels and share with them my initiative. I let them know about what I offered to Tourstart and the excellent feedback. Most of them said immediately "YES" and were really glad I shared with them the idea." Many of the hotels offer 15% discount if booked directly to the hotel, and the booking code mentioned "MotoLleida 15". The 15% discount is on the room rate and breakfast only for all the reservations made directly with each hotel. This offer will not be applied if the reservation comes through booking web pages or travel agency etc.The offer will be available from now until the 31st December 2015. Catalonia is the home of the most fantastic Pyrenees mountains, in which area most of the hotels are located. There are hundreds of different tours and destinations available. Llieda is the capital city of the region and has a long and interesting history and is one of the oldest towns in Catalonia. The history is going back to the Bronze Age and the city has both old historical buildings as well as new modern ones. The hotels which either are certified or is in the process are shown in the list, and the hotels with a link are created on Tourstart. The special discount of 15% are offered by most hotels. Check when booking. Here are examples of two tours which are offered by the Motorcycle Hotels.